With your first producing agent you can profit with us. All the administration, documentation and most memberships are paid for by the corporate office. So don't worry about initial costs! Make you the most money for your time. iPro gives the ability to build a large lucrative business while not having to deal with the administration of it. We want you to focus on growing your branch while we maintain it. The only initial investment is your time. And when you invest into marketing, we have the products and resources to help along the way. 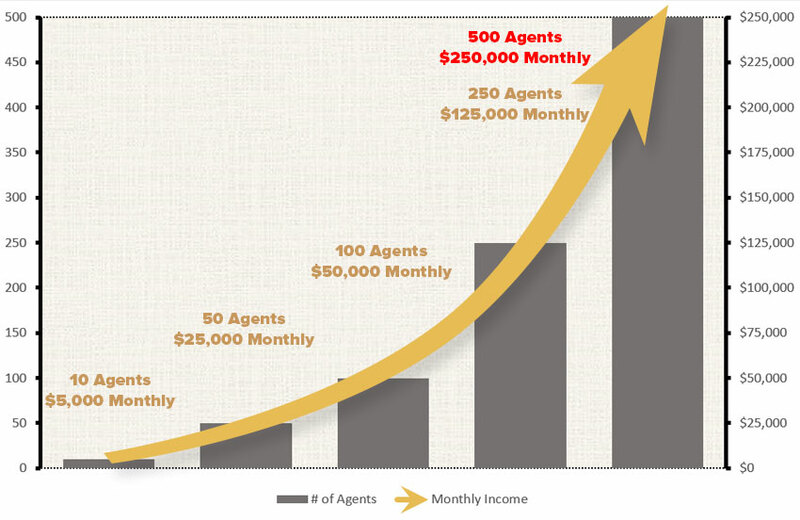 *Based on the average agent producing $500 monthly income you can see in the chart above how you can build a lucrative branch. The split is 75/25. You keep 75% of all your agent's broker fees! We encourage you to open a physical office but it is NOT required.